An adipose-derived stem cell treatment for arthritis is being tested in a clinical trial in Australia. The initial results from the trial of HiQCell indicate the treatment has the potential to postpone the need for joint repair or halt disease progression. The first human trial took place last year at Sydney’s Royal North Shore Hospital.Forty patients had injections of the patented HiQCell treatment. Although the results are not due to be published until 2013, Dr Richard Lilischkis from Australian company Regeneus said they had been “outstanding”. Early results suggest the treatment, developed by a team from Regeneus, could delay the need for joint repair by 10 or 20 years. There is the possibility that it could stop the disease’s progression altogether if caught early, researchers said. Osteoarthritis is the type of arthritis most frequently seen, because it is associated with the aging process. Osteoarthritis affects some 16 million Americans alone (many of whom do not realize they have it).It causes the cartilage covering the end of the bones to gradually wear away, resulting in painful bone-on-bone rubbing. All of the joints may be affected by osteoarthritis. Osteoarthritis can range from mild to severe. It is often more painful in weight-bearing joints, including the spine, hip and knee,and the pain is usually is made worse by movement.Osteoarthritis can occur in young people as the result of an injury or from overuse of a joint during sports or work. TheHiQCelltreatment, which has been successfully in animal trials, helps the body regrow tissue and cartilage that has been damaged by the degenerative condition. Although still at an experimental stage, the therapy could be transformational for millions of people who suffer from osteoarthritis. According to the researchers, the treatment takes three hours, during which time liposuction is used to remove seven ounces of abdominal fat. The stem cells are harvested and then injected back into the patient’s knee. Dr Diana Robinson from Sydney Sportsmed Specialists, who is one of Regeneus’ medical partners, said the pain-reliving effects were almost immediate, with improved knee function within 10 days. “In some patients we’ve been able to show around 30 percent cartilage regeneration after six months,” she said, adding that pain improvement ranged from 30 to 100 per cent. Stem cells continue to hold great promise in treating a variety of diseases and conditions, and the initial success of this Australian study furthers that promise. Some conditions, such as joint, tendon and muscle injuries, are treatable now with stem cells. Other conditions, such as ALS, diabetes, heart disease, macular degenerationand MS, appear to be treatable with stem cell therapy, but widespread treatment is still in the near-future. 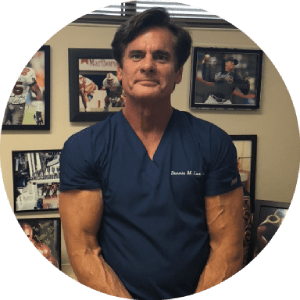 Dr. Dennis M Lox located in Clearwater, Florida Tampa Bay area has been performing stem cell therapy for severl years with great success.